Travel theme: Metal | Oh, the Places We See . . .
Green Bluff, about 15 miles north of Spokane, Washington, was fairly quiet on Memorial Day weekend. Blooms on the Bluff — a festival celebrating fruit tree bloom in this area of growers — had ended just a couple of weeks before, and the Strawberry Festival wouldn’t arrive until June 28th. Green Bluff‘s roads loop around apple orchards and farms offering spectacular views of the fresh greens of spring and glorious cloud-dotted sky. 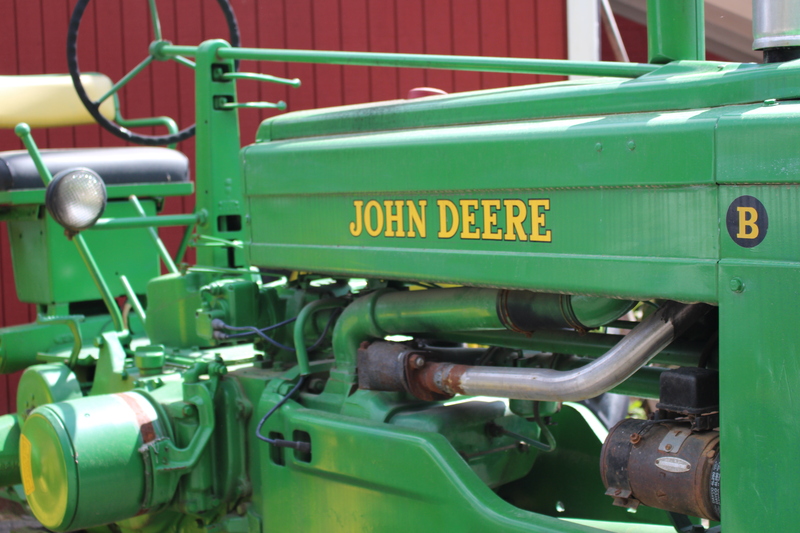 But you can also see the metal that makes it all run smoothly in the form of tractors, wagons, plows and so forth. 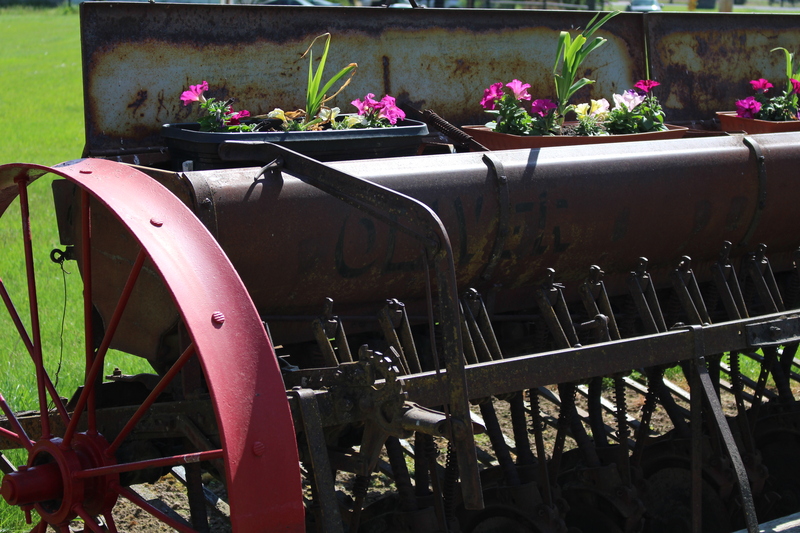 Even old farm implements whose productive farm time has ended are pressed into service as holders of colorful spring annuals. 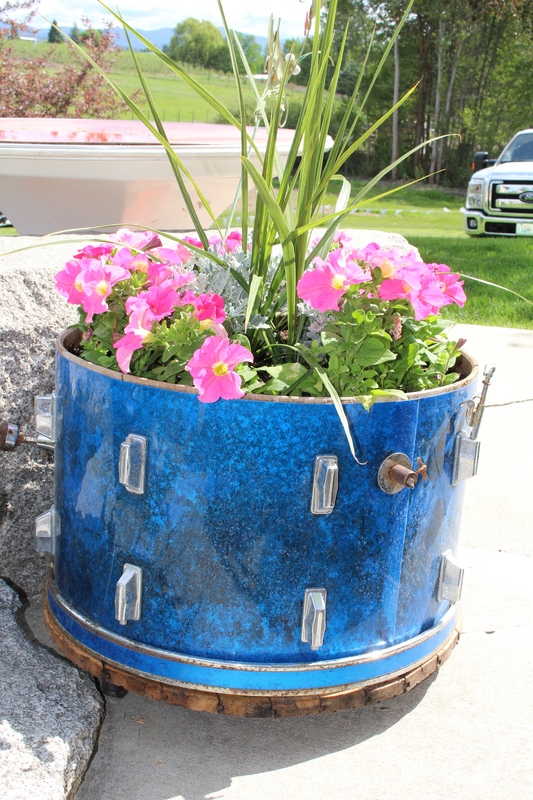 And at stop #6 — Harvest House & Orchard — several metal snare drums hold mixed arrangements ready to greet summer visitors. Our favorite metal, though, just might be this doughnut machine that Todd, the owner of Harvest House,cranked up just for us early-morning seekers of something sweet to go with our coffee. That little metal machine spit out fresh, hot doughnuts ready for the the cinnamon sugar cycle and our welcoming hands! Ah, yes. A porch-rocker morning on Green Bluff sipping coffee and downing a doughnut! For more examples of the Travel theme: Metal challenge from Ailsa’s Where’s My Backpack blog, click here. To learn more about Green Bluff — the growers and events — click here. Interested in the places we’ve seen in the Inland Northwest? Take a look at the page Inland Northwest at the top of this blog for more stories and photos. This entry was posted in Photography, Retail Shops, Travel, Travel Theme, Washington and tagged Beck's Harvest House, farm implement, Green Bluff Growers, John Deere, metal, snare drum, Spokane. Bookmark the permalink. Yum indeed! And a great place to visit. However, we’ve been 3 times — fall is by far the best — everything’s open!! Thanks for commenting. There is nothing like doughnuts hot off the conveyer belt. Yum! So true. It’s like McDonald’s french fries. You gotta eat ’em while they’re hot!!! Thanks for taking a look. If you get to that area, check out Green Bluff. Soooo much fun, especially in the fall.